Former Lt. Gov. Jennifer Carroll is blasting statements by Integrity Florida's Dan Krassner, which he made during a Monday press conference calling for stricter ethics reform. Carroll says, she should not be held up as a "poster child" for corruption because she has not been charged with any ethics violation or crime. 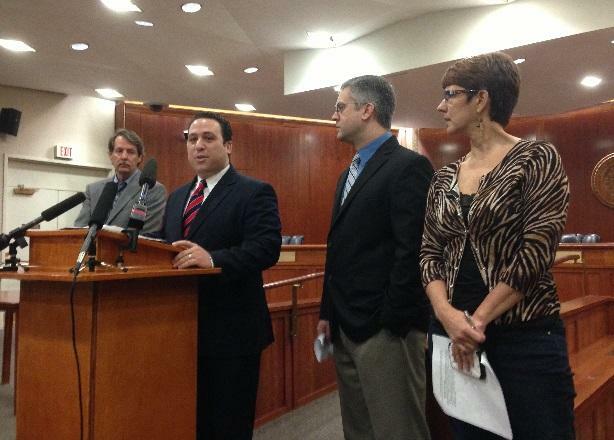 "On Monday, March 18, 2013, the group Integrity Florida conducted a news conference on proposed ethics legislation, led by the organization’s executive director, Dan Krassner. Mr. Krassner stated that Integrity Florida’s mission is to “promote integrity in government and expose public corruption.” The news conference then advocated for legislation intended to strengthen Florida’s ethics laws. I support the legislation for which Integrity Florida is advocating. I agree that public officials should take financial disclosure very seriously, take greater care in completing financial disclosure forms, suffer penalties for errors, omissions and inaccuracies and that the Ethics Commission should be given greater enforcement powers. I admit that I should have taken greater care with filling out my own financial disclosure forms from the past five-to-10 years and apologize for any confusion or concern caused by alleged inconsistencies. However, I also want to emphasize that I moved quickly to clear up errors on those forms. Yes, I made mistakes, including putting a comma in the wrong place, not explaining (which was not a requirement of the Commission on Ethics) that a jump in net worth from one year to the next was the result of an inheritance following the death of my parents and included jointly owned assets and mortgages (which were owned by my husband and his assets were not subject to reporting – though they were added to an amended form). In 2010, the Governor's campaign lawyer, Trevor Potter, even reviewed my financials, noted all line items and expressed no concerns with my forms which detailed how things were accounted for. Yes, I agree with Mr. Krassner that some of my financial disclosure forms were “sloppy at best,” but it is incredible that he indicts me by using the term “potentially inaccurate.” Potentially? Mr. Krassner said that we need to strengthen the Ethics Commission so they can “ask questions long before we have resignations or corruption probes.” Corruption probes? Mr. Krassner uses leading questions and suggestive language to hint at ethical lapses and corrupt intent. That is patently absurd. I find it offensive, degrading and objectionable that Mr. Krassner suggests that, because of how I filled out these forms five-to-10 years ago, I should now be considered the “poster child” for ethics reform and corruption. My resignation last week as lieutenant governor had absolutely no connection to that. Yes, I am guilty of being “sloppy” with those forms and making errors (that I quickly corrected). But, I am most certainly NOT guilty of ethics violations or corruption. No charges have ever been filed against me, and no one has even alleged anything to that effect – until Mr. Krassner’s outlandish, irresponsible and sensational remarks yesterday. Why hasn’t Mr. Krassner looked at Members new worth forms that indicate zero net worth? Now, in my opinion, that would be grounds for ethics violation. On other points made during his press conference, he should be applauded and supported. But, on the matter of citing me as an example of what is wrong in Florida with regard to ethics and corruption, Mr. Krassner should be ashamed of himself." In the wake of Lt. Gov. Jennifer Carroll’s resignation amidst a racketeering probe, a bipartisan coalition is calling for stronger ethics reform in Florida. The group warns, the bill the Senate passed on day one of session takes steps backward instead of forward. And a bill a House panel will consider on Tuesday does not go far enough, they say.